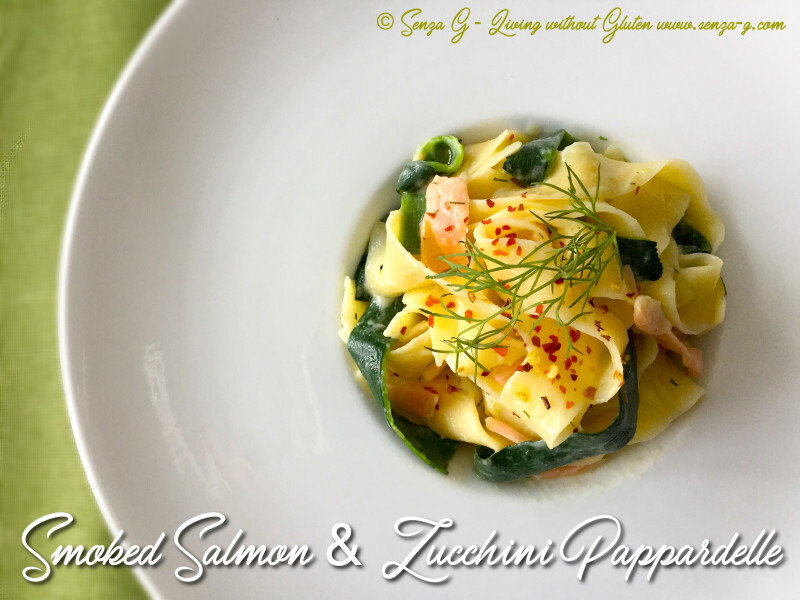 Pasta with smoked salmon has always been a favorite of mine. This quick and simple dish is usually made with fresh cream, smoked salmon and a little vodka. It is still delicious that way, however I thought of reducing the amount of cream by substituting it mostly with some simple zucchini. I still added a tablespoon of cream but if you are lactose intolerant or watching the calories, just omit, it will still be creamy and taste just as good. Using a vegetable peeler, peel the zucchini lengthwise into strips. Set these aside and then dice the zucchini. In a pan, saute the onion and garlic until they soften, add the diced zucchini and cook for a couple minutes, before adding the wine, Sambuca and the stock powder. Season with salt and pepper. Cook until the zucchini are soft. Sprinkle with dill and leave to cool slightly. Blitz everything in a blender and put back in the pan. Keep warm. Add the cream if using. In the meantime, boil the pappardelle until al dente. A few minutes before the end of cooking time, add the green zucchini strips. When cooked, drain, but reserve some of the cooking liquid. Add a little cooking water to the sauce if it seems too thick. Mix the sauce gently with the pasta and salmon until combined. Serve sprinkled with chilli flakes and a sprig of dill.